South Korea’s supreme court ruled Thursday that moral and religious beliefs are valid reasons to refuse the country’s mandatory military service, in a case that has implications for hundreds of conscientious objectors. Almost 65 years after the end of the Korean War, nearly every able-bodied South Korean male between the ages of 18 and 35 must still complete around two years of military service. Anyone refusing the call-up has usually ended up in prison for 18 months, and more than 19,000 conscientious objectors have been jailed since 1950, most of them Jehovah’s Witnesses. But the Supreme Court overturned the conviction of a conscientious objector on Thursday, months after a landmark constitutional court ruling that authorities had to provide an alternative to joining the military. At the centre of Thursday’s case is Jehovah’s Witness Oh Seung-hun, who was called up in 2013 but refused, was found guilty, and lost an initial appeal to the high court. 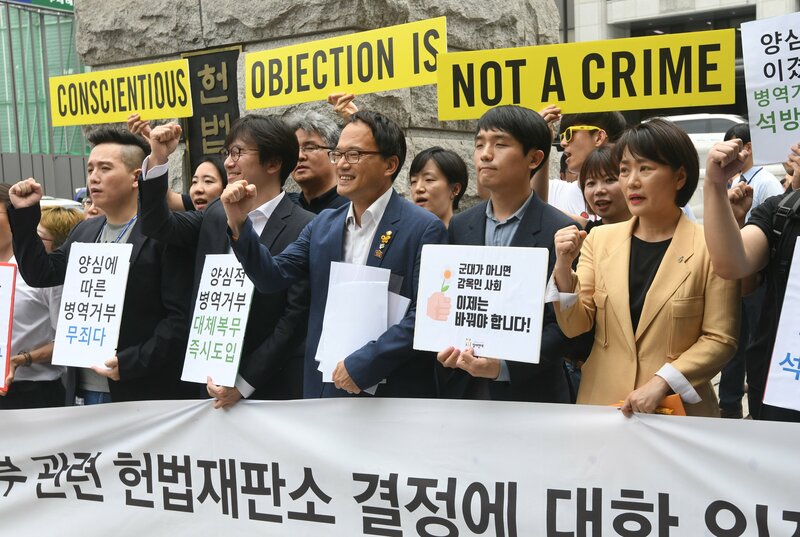 “It is the majority opinion of the supreme court that conscientious objection is… a valid reason (to refuse conscription),” said chief Supreme Court justice Kim Myeong-su. Punishing conscientious objectors “for refusing conscription on grounds of religious faith, in other words, freedom of conscience, is deemed an excessive constraint to an individual’s freedom of conscience”, he added. The decision, by a majority of nine votes to four, overturned a previous Supreme Court ruling 14 years ago. Oh, 34, said he had refused to join the military as doing so went against biblical teaching. “The bible says that everyone who uses a sword will be killed by a sword,” Oh told AFP. “I expected to suffer for objecting to conscription but I thought the pain I would feel by not listening to my inner voice would be far worse,” he added. Jehovah’s Witnesses welcomed the ruling, calling it a “huge step forward in ending this policy of imprisoning our fellow believers”. 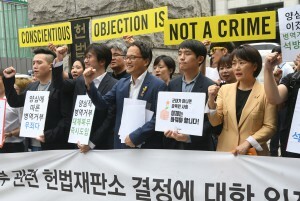 “Today the Supreme Court has brought South Korea more in line with international norms,” said spokesman Paul Gillies. According to the Jehovah’s Witnesses, more than 900 similar cases are pending in the South Korean justice system, with another 96 people currently serving prison terms for not fulfilling their duties. The South remains technically at war with the North, after the 1950-53 Korean War ended in a ceasefire rather than a peace treaty. But the ruling comes amid a dramatic dialling-down of tensions on the peninsula, with Pyongyang taking part in a series of summits with both the South and the US, long its sworn enemy. Seoul’s armed forces rely heavily on conscription, and military service often involves postings to front-line positions on the border with the North. In May 2010, a North Korean submarine torpedoed the South Korean naval vessel Cheonan, killing 46 sailors including 16 who were on military service. Pyongyang denies responsibility. In November the same year, the North shelled a South Korean border island, killing two marinesboth of them young conscripts. The social implications of the South’s military service are also enormousmen must interrupt or delay either their education or their careers to comply, with Tottenham striker Son Heung-min a high-profile recent example. He only secured an exemptionavoiding a potentially ruinous career breakby winning gold at this year’s Asian Games in Indonesia.